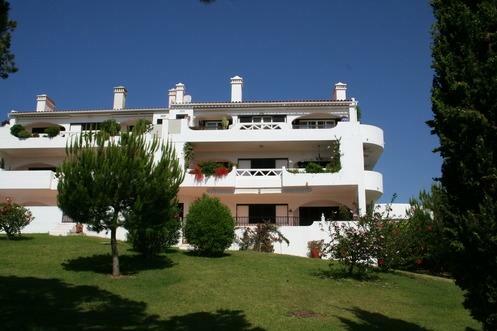 Stunning 2 bed apartment Vale do Lobo - Property for sale. Full Description: An outstanding opportunity to own a wonderful 2 bedroom apartment in "Tennis Valley" on the award winning luxury golf and beach resort of Vale do Lobo. With unrivalled resort facilities including championship golf courses, tennis academy, spa, fitness centre, swimming pools, beauty centre, top class restaurants, fabulous beach and water sports, shops and even its own medical centre there is something here for the whole family to enjoy either on a permanent basis or for holiday living. The apartment offers spacious split level accommodation in a block of only three and this one unique to the upper levels giving a penthouse feel. Maintained and decorated to the highest standard with carpets from top to bottom this is truly a home from home. From the entrance hallway stairs lead to a landing where you have the master suite with full Jacuzzi bathroom and access to a large terrace, the 2nd bedroom also shares the same terrace and is adjacent to another full bathroom. A few more stairs to the lounge with feature fireplace and dual aspect doors to more private terraces with resort and tennis views, fully fitted and equipped kitchen, dining area again with access to one of the terraces with remote electric blinds and large storage room. Originally the dining room and storage room were to be utilised as a 3rd en-suite bedroom and this could easily be changed if so required. Some more stairs then take you to arguably the best outside space in the property...the roof terrace. With built in BBQ, plenty of room for sun loungers and al-fresco dining, utility room with fridge (for those cold drinks!) and laundry area and a separate shower room you have everything you need! An added bonus are the splendid resort views and distant sea and mountain views too. This is a fantastic opportunity in a unique location and early viewing is recommended.